The Indiana State University Foundation recognized philanthropy to the university at the March On! Awards event Saturday night. "The generosity of these donors has enhanced Indiana State's scholarship offerings, academic programs, experiential learning opportunities, athletics, facilities and more," said Indiana State President Dan Bradley. "We deeply appreciate their support." University donors recognized during the evening were recipients of the 2016 March On! Award and John P. Newton Spirit of ISU Award, as well as Book and Torch Society and 1865 Society inductees. The annually presented March On! Award is the most prestigious award presented by the ISU Foundation and honors transformational philanthropy to Indiana State. This year's recipients, selected by the ISU Foundation board's development committee, include the Lilly Endowment Inc., Jack and Betty Munsee (posthumous recognition) and Donald W. and Susan Scott. Named for the foundation's first comprehensive campaign, March On! The Campaign for Indiana State University, the award signifies the important role of alumni, friends and corporate partners in ensuring Indiana State's growth and success. "These donors represent a group of individuals that have given a significant amount of money to our institution," said Ron Carpenter, president of the ISU Foundation. "Collectively, they've given millions of dollars, and we hosted this wonderful evening to celebrate their support and their philanthropic engagements." The Lilly Endowment has provided more than $45 million in philanthropic support of programs, scholarships and initiatives across Indiana State's campus and has been a partner in fulfilling the university's mission to prepare leaders. "Lilly Endowment is grateful to receive this award," said Sara B. Cobb, the endowment's vice president for education. "We are pleased with how Indiana State University's enduring commitment to students is strengthening the community of Terre Haute and communities across Indiana and beyond." The investment has brought dynamic, transformational initiatives to campus, including the endowment's largest gift in support of the Networks Financial Institute operated by the Scott College of Business. Launched in 2003, the Networks Development Program provides full in-state tuition scholarships to Scott College of Business students. To date, more than 130 graduates have completed the intensive experience. Also a member of the ISU Foundation's Book and Torch Society, the Lilly Endowment has invested in the Extending Teacher Creativity project and Focus Indiana initiative to help address niche needs of Indiana State and its students, as well as those of the local community and state. Jack Munsee worked as a life sciences professor at Indiana State from 1959 to 1987 and was an early adopter and advocate of recycling before his death on Oct. 16, 1997, at age 80. The Munsees received this posthumous award for the establishment of the Jack R. and Betty Beron Munsee Scholarship in Ecology in 1998. Through a persistent dedication to inspiring students to pursue their dreams, annual contributions to this scholarship fund were made for more than 20 years. "(The Munsees) supported the university throughout the years, dating back to Jack Munsee's leadership on faculty here," said Ken Menefee, ISU Foundation development officer. "Through this scholarship, Indiana residents who have the desire to study ecology can get off on the right foot as they enter Indiana State as freshmen." To date, this scholarship endowment has helped nearly 20 students pursue degrees in ecology. 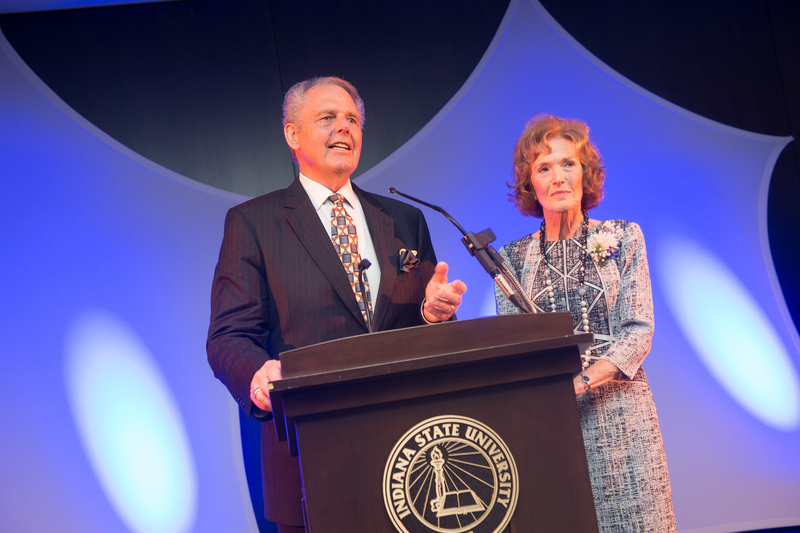 "After losing Jack, Betty's steadfast commitment to supporting ISU and its students both honors his legacy and is an example of the passion that our faculty and their families have for Indiana State University," said Catherine Saunders, executive vice president of the ISU Foundation. "Betty's generous endowment support, through both annual and estate gifts, has provided the ecology program with a powerful tool to attract students and support their education." "I am a believer in giving back if you can and I'm fortunate to be in position to do that, so I figured that if I could do something to help the school and Terre Haute, I should. I just love that building," said Don Scott, who credited his wife, Susan, with helping him achieve success. Both are natives of Terre Haute. The building reopened as the home of the Scott College of Business in 2013. "The Federal Building was built the year I was born, and I went in and out of it for years to pick up mail while I was working in the insurance business," Don Scott said. "I have always loved and appreciated the style and the architecture of that building, so when the opportunity came up to do something with the College of Business, I thought it would be good to do." New members of the Book and Torch Society were also recognized Saturday evening for their dedication to the growth and success of the university. Honoring Indiana State philanthropists for lifetime giving to the institution, the donors are inducted at the Knowledge, Inspiration and Truth levels. The charter members of this elite society were first recognized by the foundation in 2007. Since then, the Book and Torch Society has grown to more than 1,000 donors, including those dating back to the inception of the university. Five new members were also inducted into the 1865 Society, honoring those individuals who understand the importance of providing for the future of Indiana State. This society recognizes individuals who have included Indiana State in their financial estate planning by leaving an impactful legacy. The 2016 John P. Newton Spirit of ISU Award was presented to John and Marilyn Thyen Saturday night. 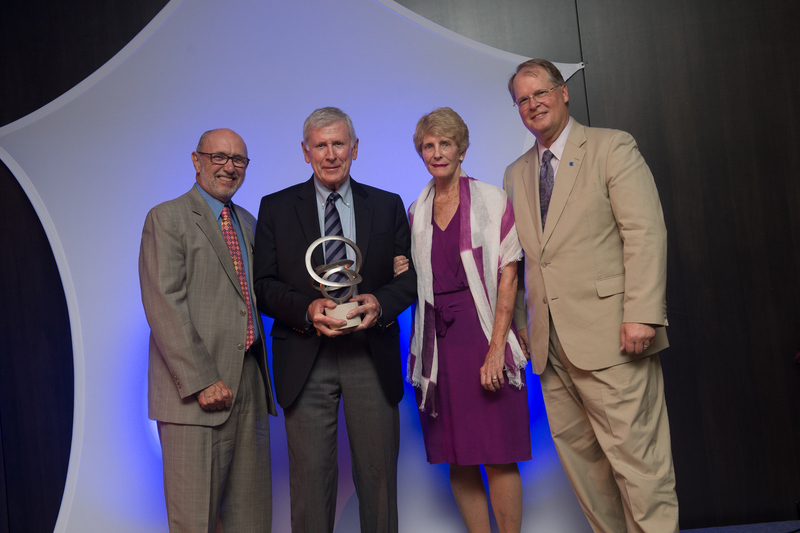 Established in 2010, the John P. Newton Spirit of ISU Award honors John Newton's longstanding career as the vice president of alumni and constituent relations and his contributions to advance alumni engagement at Indiana State. This award continues to honor alumni who, like Newton, show a deep connection to their alma mater and go above and beyond for Indiana State. Those recognized during the evening were recipients of the 2016 March On! Award and John P. Newton Spirit of ISU Award, as well as Book and Torch Society and 1865 Society inductees.